Going to see The Cure tomorrow night at the Hollywood Bowl. I am so excited, been a Cure fan FOREVER. 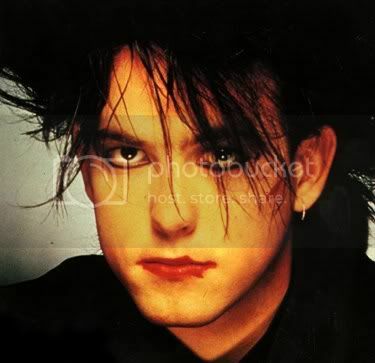 Had a huge poster of Robert Smith in my room in high school and it was one of the only ones I took to college. Later on, my first college roommate (who became my best girlfriend in college) told me it scared her!! Ha! Didn't mean to do that. I'm going with my music buddy, Tiffany. We went to see The Killers last year and had a little toooo much fun. 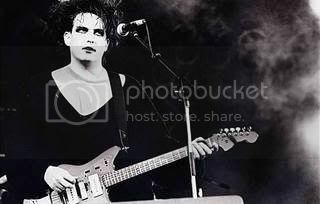 I think tomorrow night is going to be fairly mellow, just us...a bottle of wine...thousands of other people...and Robert Smith serranding us under the stars. I can't wait! I am having a ball playing with my new Threading Water punch. It punches a scalloped border with holes inside the scallops. I was seriously considering putting the edge of my t-shirt through it, but don't think it would cut enough. How cute would that be? Here's my first project. I am going to a scrap retreat next weekend and we do all sorts of games and challenges. Everybody donates stuff for the prize table. Somebody donated this pear scented candle and I dressed it up a bit! Fun stuff!! Happy Memorial Day to everyone! I hope you are all having a safe and fun holiday weekend. My heart goes out to anyone who has lost somebody while fighting anywhere in the world. I have great uncles that fought in WW II and according to my mom, they NEVER talked about their experiences once they were home. It must have been mind blowing. I wish war wasn't part of this world, it's so destructive in so many ways. In the great words of John Lennon...GIVE PEACE A CHANCE. Peace and love to you all! 2. Good friends that come over even if they have to drive a bit. 5. Twizzlers. Bought some today when I was crusing through Michael's. Haven't treated myself in a while, and today was the day! While I was Michael's I found the highly elusive Threading Water punch from Fiskars. YEAH! It's been sold out everyone i've looked online. PLUS I had a 50% coupon...double whammy!!! It will punch a scalloped border on anything. Well, maybe not anything. But i'm sure going to try! Actually, reveal day was May 15th at Scrapbooker's Club House, but things have been so busy I haven't been able to blog share. So, here I am to blog share! The Pink Paislee paper is my favorite paper in a long time. The layouts pretty much made themselves. I also had vinyl Thickers, a Hambly transparency, self adhesive clear journaling spots from American Crafts and lots of Pink Paislee punchouts to work with. I absolutely loved this kit! Lots of good stuff in the gallery over at Scrapbooker's Club House! Come on over and see. I'm just going to share a few photos, I took over 400 and had to really whittle it down!! Here are some family photos from the rehearsal dinner. It was at the Sierra Nevada house, where we drank...well...Sierra Nevada! It was really mellow and low key after the rehearsal. Here are my 3 other siblings. Yes, I am the shortest!! To be fair, my sister was wearing these really tall wedge sandals...but she still is taller than me! My sister and Jason got married in a little Gold Mining church in Coloma. The church was built in the 1850's and the alter was handmade from fruit crates. It was really pretty. We got ready at a wonderful Bed and Breakfast the morning of the wedding. Kayla sat through hours of hair curling and braiding and that was all without the help of champagne...like the rest of us had!! I don't why, but I love this photo. I like how you can see my sister's ring and how she is in the makeup chair and the reflection of the paparazzi in the mirror. A different perspective. The wedding was beautiful, what I saw of it through my tears. I swear, I am such a crier now. Ever since having kids I have turned into a big cry baby!!! My kids were so cute as flower girl and ring bearer. I'll have to wait for the real photographer photos for those. For some reason, my sister didn't let me carry my camera down the aisle. The reception was at another B&B about 50 feet from the church. The weather was so nice and the B&B was gorgeous. There was a pond and a tree swing and it was so green and lush! Here are 4 generations of Wees women. My Great Aunt Caroline (Sister Caroline) who has been a Franciscan Nun for over 50 years, my mom, myself, and my daughter. Can you see our polish heritage? Look at that backdrop, just beautiful greens!! This is my BFF from 6th grade, Beth. She came with her family to the wedding. We were tripping out that she remembers my sister being 5 years old when we first met! And here we are with the bride and groom! They were SO happy and we were too and we had a fantastic party!! This pretty much sums it up!!! BTW, Jason is from Maine, hence the lobster reference. We had a fabulous time! We flew up to my sister's wedding last weekend and it was the kids first time flying. They were excited and had a hard time sitting still in the airport. They loved taking their shoes off for security, that was super exciting! When we arrived and landed, the flight attendants and pilots welcomed the kids into the cockpit. They got to sit in the pilot's seat, push a bunch of buttons and pretty much sat in awe of the control panel! This is the luggage statue in the middle of the baggage claim area at the Sac airport. The kids thought we had to sort through the tower of bags to find ours!! The next day most of the girls in the wedding party plus mom's went to get their nails done. This would be Kayla's first time getting her nails done. She was in HEAVEN! She picked sparkly magenta color for her toes and a pale peach for her fingers. 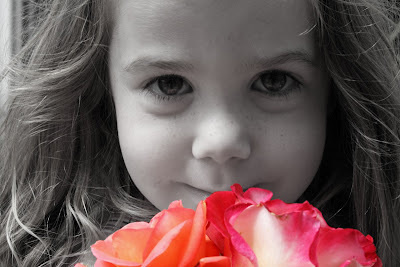 She even got flowers on her fingernails! She loved it...and so did I. I love getting a pedicure, just don't have the time for it lately. Like in the past 7 years!! Ha! Here is the bride-to-be getting pampered! I have lots more wedding photos to come...stay tuned! With my obsession with the Rock of Love show lately, how could I pass up a Scrapping the Music challenge featuring Bret Michaels? The song is Something to Belive in by Poision. Now, I wasn't a fan back in the day, but love that reality show!! I also used a sketch from Scrapbooker's Club House sketch extravaganza. I've been busy!! The journaling reads "I Believe...these 2 just spent all their allowance." Thanks for the great challenge and sketch!! TFL! I really enjoy the Sketch This website. Lots of great inspiration here!! I used sketch #50 for this layout. I also used some drywall mesh, which was for a challenge from Tammy over at Scrapbooker's Club House to use your stash...use your magic mesh stash! I didn't have any magic mesh, so I dug up some drywall mesh instead. Thanks for the sketch and the challenge!! I am finally sharing my projects from the Lucky May kit from Scrapbooker's Club House. I had the pleasure of working with the Lucky line from Rusty Pickle. I loved the blues and greens, pretty much perfect for any time of photo!! I made this mini album from some WRMK 4x6 file folders. This was a trip to the farm that my kids and my niece took a while ago. And here's a mini album I made for my brother from just one piece of 12x12 cardstock for the base! From May 12- May 21, Scrapbooker’s Club House will have celebrities featured for a full TEN DAYS in an extravagant celebration of talent and creativity! You’ll be able to create layouts from sketches designed by some of the biggest names in the industry, chat up a storm, meet new faces and experience the warmth and friendliness that the Club House is famous for. All the creativity, talent and friendliness combined at this extravaganza will blow the ROOF off the Club House! So, come on by, check out the “Celebrity Sketch Extravaganza” and join in the fun!! You definitely don’t want to miss a single sketch and we know that you won’t want to leave this “happening,” friendly place! Join us for the “Celebrity Sketch Extravaganza” at Scrapbooker’s Club House from May 12-21, 2008. It’s going to be AMAZING! Come on over and join us!! It's going to ROCK the clubhouse!!!! Well, National Scrapbook Day Weekend is over and I have a scrapping hangover!! Had a gob of fun with my girlfriends all day Saturday. We drank margaritas and martinis, snacked, listened to good music and scrapped alot!! Then on Sunday, in the process of cleaning up, my kids decided they wanted to scrap too. So we did! It was amazing, we scrapped for about 3 hours. They were fully focused and had so much fun! They made a ton of 6x6 pages for their albums. They had the best time going through my stack of photos together. Just remembering the events and photos and laughing and giggling. It was so great to watch them remembering and seeing their faces lighting up at a particular memory. Very cool. So...here are some layouts and cards that I completed. And here are my kiddies...so happy and content. It was too fun!